Camping/accommodation: as such a short trail, we only spent one night camping on it, in the forests on Keeper Hill. I'm not sure how much accommodation is available near the trail. 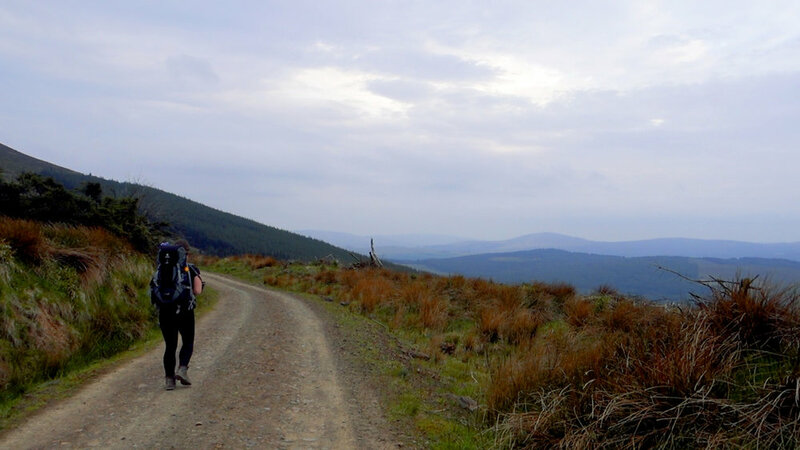 Taking us a day and a half (possible in a day if you start early enough), the Slieve Felim Way has some gorgeous views and old forest stretches. The trail itself is made nearly entirely of forestry roads. I personally find forestry roads hard underfoot, and therefore extra tiring, but some people find them enjoyable and accessible, so I think itâ€™s just a case of personal taste. What I loved about getting on this trail was climbing the hills again. Weâ€™d done a number of flat trails before hand (2 canals), and it felt great to push myself and properly sweat again, fight for breath and feel muscles aching. We started in Murroe, which was more of a village than I expected it to be. Stopping at the shop we stocked up on fruit cakes and had some bananas for breakfast. It was a busy place, with a constant stream of people coming and going. It was also clearly a grass cutting Saturday; every second transaction was for petrol, two-stroke, or weed killer. Eventually we relinquished the picnic table and shouldered our bags. The route took us along some small roads, winding out of the village and up some short steep inclines. Reaching the forests on the outskirts of Glenstal Abbey we were back onto trails, walking through some beautiful deciduous trees. After a while these faded away, and we were in traditional Collite forests, on their forestry roads. A few hours late,r, after walking 2km along a busier road than we ever like to walk on, we took our lunch sitting on a small foot bridge, our packs lying beside the steps. Neither of us ever sit on our bags, me especially as I carry all the electronics, and crushing a hard drive with the only copy of 500+km of walking is never my idea of a good day. So our bags were just sitting there, waiting for us. We eventually decide to move on and we haul our packs onto our backs, buckling and tightening as we take our first steps. But wait. My bag felt really weird. Pushing my hand between my back and the bag, I immediately feel a very odd, very pronounced bump. I take it off, and sure enough, some of the bottom panelling had just bent out of place. With backpacks like ours, many of the key parts of it are readily accessible ... but this was something that was not. We took everything out, we poked it. It bent back out when we stopped poking it. It was a complete mystery. Seeing as weâ€™re in the middle of a trail, and in the middle of nowhere, the only option was to pull the bag back on and keep going. At first I wasnâ€™t sure if I was just imagining it, but once some time passed I decided that the bag had definitely lost some structural firmness, with the top half of the bag now rocking and moving more freely than before. Not exactly how I expected to end our lunch. Over the rest of the trail I repacked it in different ways to see if there was at least a best way to pack it, but never quite found one. On our first day we had planned on finishing around Toor (also spelt Tour, and Tuor, depending on what road sign you read), and in that tiny village we came across a gorgeous small park, containing a stream, map of the route, picnic benches, and a the drum of an old washing machine that had been recycled into a hanging fire drum. It felt like we could possibly camp there, but we really couldnâ€™t tell. The village, consisting of some houses clustered around a bend in the road, was empty and silent. We eventually agreed to move on into the main forests again. I remember that as we were leaving Toor I decided that once weâ€™d finished this climb out of the valley weâ€™d stop, maybe eat a fruit cake, film some talking, and bed down early for the night. What I didnâ€™t expect was just how long that up hill was going to go. I clearly hadnâ€™t looked at the map contours, as we climbed for I think 3 hours, until finally I realised we were climbing over Keeper Hill, and the highest point of the trail. We filmed some windy mountain talking, and carried on a little further until we were sure we were going down hill again. It was a pretty magical evening, the sky containing every shade of pastel pink and blue. The forestry contained a lot of fallen trees, so we decided that camping in the forest might be dangerous, and pitched the tent on wide area of the forest road meant for machinery to turn in. It definitely hasnâ€™t made it into our top 50 camping spots, but it was memorable. Waking up the next morning at 6am, clouds were streaming past the tent as they climbed the last few meters to the top of the hill, hiding all views above and below us. We ate some bananas and moved out. It felt like many of the forest roads we walked were rarely used as we came across 2 deer, some rabbits, and something like a stoat, or an odd looking large squirrel. We also encountered a wandering herd of cows, who were the stealthiest livestock weâ€™re ever met. As soon as they would see us approaching theyâ€™d all climb back into the forest, and somehow silently disappear, only to be back grazing the roadâ€™s banks when we rounded a new corner a kilometre further along the trial. I think if I remember right we finished that second day around 11am, wandering into a busy Silvermines. Cars were parked along every ditch, and we saw some stragglers enter the church late for whatever event was taking over the village for the day. We quickly found a small pub and ordered a mix and match breakfast - coffee, 7up, and crisps. We sat and chatted as the bar woman swept the floor, telling us about the bikers that come camp in the field every now and again, and what a wonderful crowd they were to host. It certainly seemed like a great pub to go to - one of the rare small town pubs that doesnâ€™t watch each sip of coffee you take if youâ€™re not a regular, leaving you to sleepily relax in the corner, and joke about GAA once youâ€™ve woken up a bit. When the people from the church started filling in, we decided to take our leave - it turned out to be a communion that the whole town had turned out for. We went and found a bench, munched on our last bananas, and waited to meet up with my uncle who lived close enough that we could ask for a lift (and then later a room). In general it was a fairly enjoyable trail. It's probably something I'd recommend doing without big bags of gear, and just go out and do as much as you can in a day. I'd actually imagine it would be a nice run, if you're into that kind of thing. The climb up and around Keeper Hill was definitely the best part of the walk, which is easily accessible from Silvermines. If you're not a fan of forestry roads, this may not be the trail for you. There is however only a handful of the 45 kilometres along tarred, trafficked road.